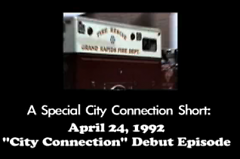 A clip from City Connection's first episode on April 24, 1992 with Mayor John Logie. Here at GRTV we constantly meet people with a need to share ideas. Whether it be analysis of our culture, exclamation of faith or sharing talents and interests, we love being a venue for sharing ideas. Fortunately we have the opportunity to be a bit more than that too. A show called "City Connection" will be going live next Monday, March 1st at 5pm that gives Grand Rapids residents the chance to directly ask questions of our Mayor, George Heartwell. We're no longer just sharing ideas but creating a little more transparency in government by bridging the gap between residents and their elected officials. 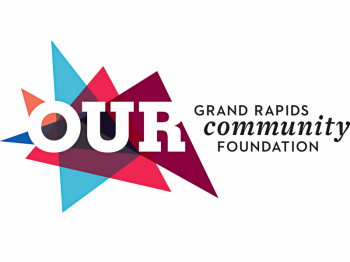 Hosting will be GRTV's own Outreach Coordinator Barbara Hansen O.P. However, we can't take credit for this show. 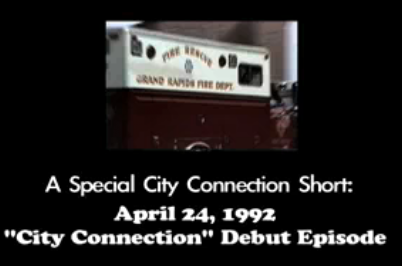 What many may not know is that this show has been running since April of 1992. It was actually started by former Grand Rapids Mayor John Logie and has been running on GRTV stations ever since. When Mayor George Heartwell took office he saw it was important to continue the tradition started by his predecessor. In the 18 years it's been on the air, the format has stayed relatively the same while technology has made it that much easier for Grand Rapidians to share their own ideas. We use today's technology to make City Connection even more accessible to the public at large. You are now not only able to call the show live by tuning in at 5pm on the first Monday of the month but you can easily Tweet questions for the Mayor @GRTVaccess while watching it online at www.grcmc.org. Or if you become a fan of GRTV on facebook, you can post a video question for us to use during the show. If you're not a social networking type of person you can always call 459-4881 during the live broadcast or send an email to [email protected]. We'll be sure to include it in the next show. All this social streaming is a bit daunting but it's letting people share their questions whenever and in whatever way they feel comfortable. So please, take advantage of this unique opportunity Monday, March 1st, by tuning into GRTV's sister station LiveWire, Comcast Channel 24 or online at www.grcmc.org. Send your questions in today or wait to respond in real time at 5pm on Monday. We hope to hear from you.